Man, this pasta dish is good! The original name is actually—I kid you not—"Really Good Noodles & Chicken," but I wanted to call it something that actually describes what's in it. This cooks in about the amount of time that it takes to boil your spaghetti! The original recipe also has tomatoes and bacon in it, but we didn't have any. I also adapted this to be cooked entirely by stovetop, since we have NOT been having grilling weather! Boil salted water for pasta. On another burner, heat (empty) skillet over medium-high heat. 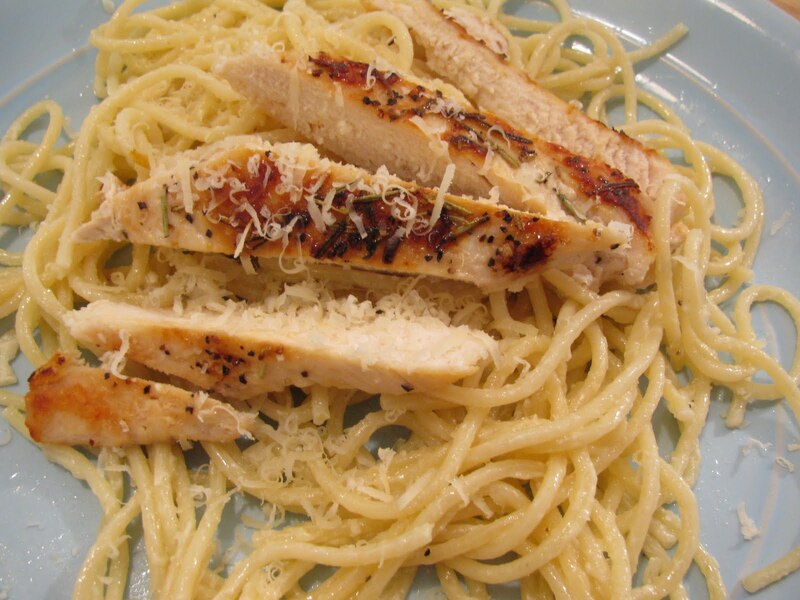 Brush both sides of chicken breasts with olive oil. On one side, sprinkle black pepper, salt, and dried rosemary. When skillet is hot (really hot—it will start smoking slightly), place chicken breasts in pan. (I recommend covering them with a lid as well unless you want to set off your fire alarm.) Cook about 5-7 minutes or until very brown; flip breasts over with tongs and cook 5-7 minutes on other side. Once chicken is thoroughly grilled, remove from pan onto cutting board. Lightly pour lemon juice over hot chicken breast; slice into long strips and tent with foil until ready to use. Once pasta is almost done, melt butter in large skillet over medium heat. Add garlic; cook for a few minutes until lightly browned and softened. Add cream, salt and pepper. Cook for another minute or two until bubbly. Add in pasta and parmesan cheese. Serve, topped with chicken and more parmesan cheese (and bacon and tomatoes if you so desire).